Courtesy photo Carfentanil is used as a tranquilizing agent for elephants and other large mammals. 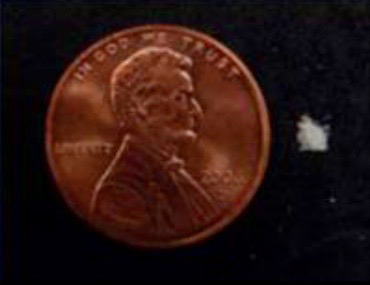 The lethal dose range for carfentanil in humans is unknown; however, it is approximately 100 times more potent than fentanyl, which can be lethal at the two-milligram range (as seen in this photograph). NASHUA – News this week that at least three overdoses in Manchester and Meredith are linked to Carfentanil, the powerful painkiller designed for use on large animals such as elephants, is setting first responders in Greater Nashua on edge. “If it’s been in Manchester, it’s going to find its way here,” said Nashua Police Chief Andrew Lavoie. As the opioid addiction crisis in New Hampshire has evolved in the past few years, the synthetic opioid fentanyl has become a deadly ingredient. Cheaper to manufacture than heroin and far more potent, fentanyl is responsible for most of the overdose deaths last year. As little as two milligrams of fentanyl is considered enough for a lethal dose. Carfentanil is 100 times more potent than fentanyl. Lavoie said police in New Hampshire have been aware of the possibility that Carfentanil could come into the Granite State for about a year, since getting alerted by federal authorities that the drug was turning up in other states. “It’s been on our radar for awhile,” he said. On Tuesday, Gov. Chris Sununu announced the drug has started turning up in Manchester, marking the drug’s introduction into New Hampshire. “It presents a serious risk to public safety, first responders, medical treatment and laboratory personnel because it can be absorbed through the skin or accidently inhaled so these individuals should exercise extreme caution and seek immediate medical attention should exposure occur,” Sununu said. The drug has not shown up in Nashua yet, Lavoie said. The city is experiencing a low in the number of overdoses this month, with six recorded overdoses as of Monday. If that figure holds for the rest of April it will be the lowest number of overdoses Nashua has had in a month in about two years. Chris Stawasz, with ambulance service American Medical response, is cautioning first responders to be cautions when going to overdose calls. Exposure to skin, of inhaling the drug, can lead to an immediate overdose, according to Stawasz. First responders are being told to carry extra doses of naloxone, the drug that stops opioid overdoses.